Disruptive technologies can often sting seemingly untouchable incumbents. In this case, Boeing has hedged its bets. The age of hybrid-electric commercial aircraft is right around the corner. A start-up backed by Boeing (NYSE:BA) just hit an important milestone in its quest to be among the first to cash in on the technology. On May 21, Zunum Aero signed a deal to sell up to 100 of its electric-powered planes to JetSuite, a charter and scheduled service company. Financial terms of the deal were not disclosed, but deliveries are set to begin in 2022. ARTIST RENDERING OF A ZUNUM PLANE. IMAGE SOURCE: ZUNUM. 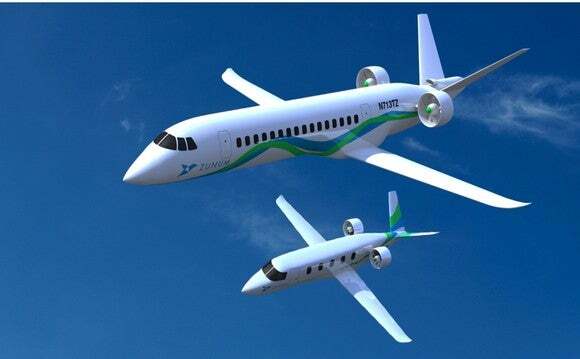 Zunum, based in Kirkland, Washington, in the shadow of Boeing’s commercial operation, is developing a 12-passenger aircraft powered by twin electric-motor-driven fan blades, with a conventional fuel-powered engine as a backup at least initially. The battery packs will be in the aircraft’s wings. The plane, which due to U.S. government regulations would likely only seat nine on commercial flights, is designed for trips of 700 miles at a maximum cruise speed of 340 miles per hour, competitive with current small regional aircraft offerings. The company expects to do flight testing in 2019 and begin deliveries to JetSuite three years later. Boeing owns an undisclosed stake in Zunum through its HorizonX venture arm, which also earlier this year invested in battery development start-up Cuberg. As battery technology continues to improve, larger airplanes are planned. JetSuite is privately held and flies from terminals in California and Nevada using Embraer regional jets. But it plans to expand nationwide with the help of funding from Qatar Airways. JetSuite and Zunum have mutual backers, as the venture arm of JetBlue Airways (NASDAQ:JBLU) has invested in both companies. JetSuite wants to use smaller, less-congested airports as it tries to expand, but those airports are often in urban or suburban areas where jet noise can be an issue. The company hopes the combination of Zunum’s lower operational cost and quieter motors will give it the permission and economics needed to fly to what are currently underserved aviation markets. Boeing has soared in recent years thanks to strong sales by its commercial aircraft division. With a substantial order book for its 737 narrow-body jet and continued strong interest in its 787 Dreamliner, the business shows no signs of weakening anytime soon. But new commercial platforms are expensive, and even a goliath like Boeing needs to be choosy about what parts of the market to invest in, leaving potential holes in its portfolio that can be exploited by upstarts. Those were the conditions that led to an ugly dispute with Bombardier last year after Boeing accused the Canadian aerospace company of dumping its CSeries jet on the U.S. market at a highly discounted price. Bombardier had discounted its jet to win an order from Delta Air Lines in competition with Boeing, but the U.S. International Trade Commission ruled against Boeing’s unfair-trade complaint in part because Boeing does not have an offering in the 100-seat size, where the CSeries was competing. The dispute arguably caused Boeing more trouble than it was worth, ruffling feathers in Canada and causing the Canadian military to cancel plans to buy 18 Boeing fighter jets. And it led to complaints from the United Kingdom, where much of the CSeries is sourced. Electric planes are another area where competition is looming. Boeing archrival Airbus last year teamed with Siemens and Rolls-Royce to develop a hybrid-electric propulsion system, and others including NASA and the U.S. military are exploring electric planes. Investing in Zunum is a low-cost, low-risk way for Boeing to gain exposure to the nascent electric plane market and make sure it isn’t caught off guard, as it was in the CSeries competition. Even if all goes right for Zunum, the start-up’s results won’t impact Boeing’s bottom line anytime soon, but long-term investors should applaud the company’s pragmatism.